One of joys of being a switcher is getting to know Apple's remarkable suite of built in software. After spending 20 years of scraping bloatware off PC computers it is quite a paradigm shift to find that not only am I keeping the built in Apple applications, I'm actually using them. This of course includes Apple Mail. Like everyone else, I have too many email accounts. Apple Mail handles these accounts like a champ. I'm not, however, one of those guys that use my Email inbox as a "to-do" list. I like to keep it empty and my mail nicely filed. Unfortunately, between taking care of clients, volunteering in the community, helping my wife with her business, my new-found friends in the Mac community and several other commitments, it quickly became obvious to me that I needed to get better organized with the daily piles of email. 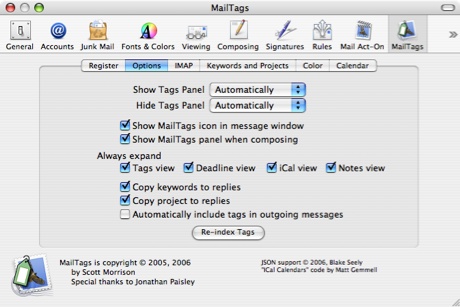 MailTags 2.0 is developed by Indev and can be found at http://www.indev.ca/MailTags.html. It is an add-on application for Apple Mail that shows up under the preferences window of Apple Mail. The official release is version 1.2. This review is of Release Candidate 1 of version 2.0 which includes a great deal more functionality. The key to MailTags is, well, Tags. Like so many enlightened Mac applications this allows you to give an item multiple searchable labels. For example, I'm getting ready to spend a few afternoons in my daughter's 5th grade class explaining how the judicial system works and helping them in their own mock trial (Did Humpty Dumpty fall because of an accident? Or was it Murder?) So with this project I've got a series of emails from the bar association, a friendly attorney, and my daughter's teacher. I'm tagging these emails as "Humpty Dumpty". But I'm also tagging some of them as "School", "Bar", "Legal", and "Samantha" depending on source and context. Using MailTags (or spotlight) I can easily search out this collection or any portion of it. Put simply MailTags brings order out of the chaos that is my email archives. Version 2.0 adds IMAP functionality with a special header or in clear text format so that any IMAP client can read and interpret the tags. Not only does this allow you to keep your tags for your various IMAP clients, it also allows you to search with Spotlight and send the tags with your outgoing mail. The program even detects when you change your tags and automatically updates it among your several clients. So with this update MailTags jumps off your local computer and into all of your IMAP mail applications. In addition to the IMAP upgrade, version 2.0 makes several "workflow" improvements. Emails can be a launching pad for projects and you can create task list items and iCal events. For instance, when I received the email from my daughter's teacher confirming the date of the Humpty Dumpty trial, I was able to create an iCal to-do item to write a keynote presentation and create an iCal calendar event for the presentation straight from the MailTags pane. This really ramps up the productivity and assures I won't forget to do it later. As somebody who is constantly setting appointments and task list items from my email, this feature is worth the price of admission alone. Speaking of the price of admission MailTags will cost $29.95 once version 2.0 is formally released which, from reading the web site, seems to be just about any day. In the meantime, while it remains in public beta, you can purchase a registration code for $25. Whether its $25 or $30, it is a good value in my opinion and I already bought my license. Indev has a companion plug-in called "Act-On" . Indev accurately calls this program "inbox triage". Act-On allows you to trigger Apple Mail rules with keystrokes. This allows me to quickly work through my in-box moving email to its appropriate archive. Act-On is open source but donations are requested. I am also using this product. I have created several archive mailboxes in Apple Mail. They include subjects such as Business, Friends, Family, Legal and Mac related. I also have folders for mail that requires a more detailed response. That is it. With MailTags I don't need complicated nested subfolders. With Act-On I've made a series of shortcuts that allow me, with 2 keystrokes, to file each email in its proper archive. The Act-On shortcuts are ridiculously easy to program, even for a non-programming arts major such as myself. I even put in a pleasant little "ding" when it completes each action which gives me a very satisfactory, yet somewhat irrational, smile. Using these two programs I have a new, streamlined, way of taming my inbox. I read it, tag it, make to-do's or calendar entries, and mark it for further reply or archive it with just a few keystrokes. Just like that. "Ding". MailTags and Act-On supercharges Apple Mail. If you are having a daily battle with your inbox and can't find anything a month later, I definitely recommend giving these programs a spin. One last plug I'd like to put in for Apple Mail power users is an excellent website, Hawkwings. This is a site devoted solely to getting the most out of Apple Mail and really well done. If you are interested in more mail power tips, you should definitely take a look.